The leaves are just starting to turn color here and the first snowfalls have landed in the high country! With that in mind, I wanted to put some information together on our new Airbag 3.0 as people start looking toward the winter season. 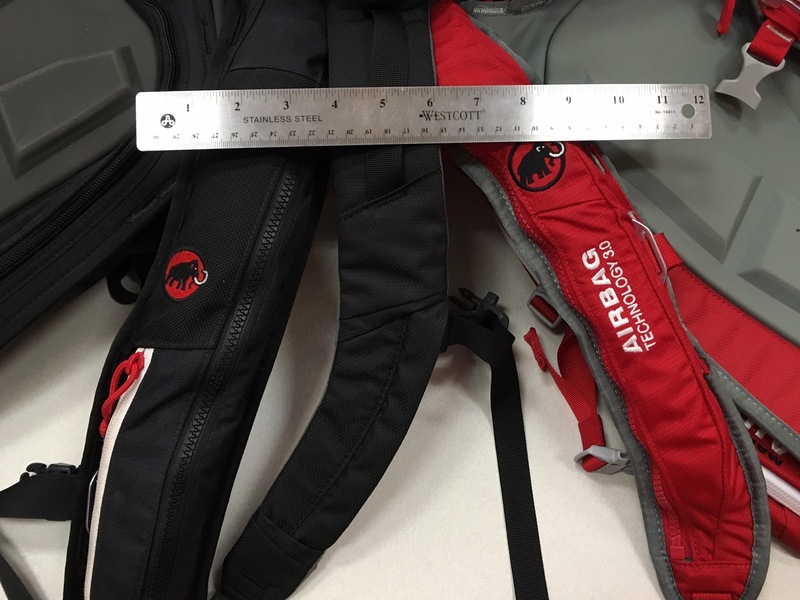 Mammut will begin delivering the new Airbag 3.0 system and backpacks to retailers during late September and early October of 2016. In addition to being much lighter weight and more compact, the new airbags contain several improvements over the previous versions. Now that a couple of sneak-peek product reviews have been published some people have had questions on exactly what the differences are compared to the previous version, and I want to answer those questions that have come up and provide some more detailed info. If you've been shopping for a new airbag or are following the technology, this article is for you! So, what's so new? Mammut still has 2 different airbag systems. The Removable Airbag System (RAS) and the Protection Airbag System (PAS), which use the same mechanism but are shaped differently and attach to the packs differently. The RAS system is a square 150l airbag that is contained in and deploys from the top of the pack and is focused mainly on light weight and low packing volume so it eats up less of the space in your pack. Some people have questioned the ability of these packs to provide legitimate trauma protection--our claim of trauma protection is based in large part on a scientific study which can be found here: LINK. 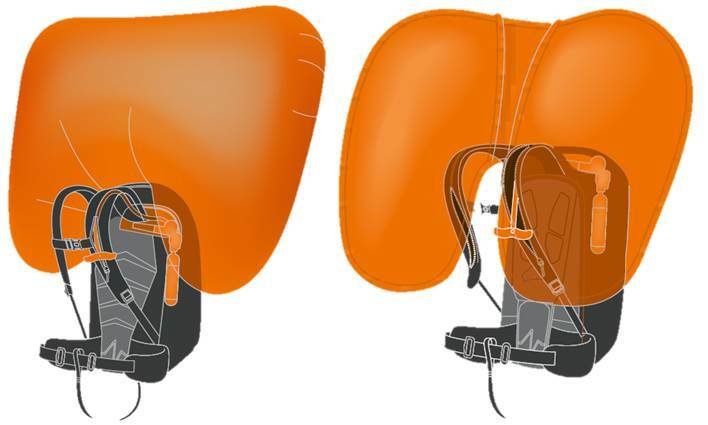 In short, this study showed that the shape of the protection airbag--represented in the study by the LIFEBAG, which is the same-shape predecessor of the PAS--reduced the g-forces measured on the head and neck of a dummy in an avalanche roughly in half. Although some other manufacturers claim some degree of trauma protection, no other airbag shape has been shown to provide this effect. Research from the automotive industry correlates this reduction in g-forces with a reduction in traumatic injuries. Obviously major trauma wont be completely avoided, but the intention is that providing some protection in a survivable avalanche could be the difference between significant injury and needing a rescue versus skiing away with only minor injuries or just bruises. Of course good judgement and avoiding trouble in the first place is always the only certain way to avoid injury. In comparing to our previous airbags it's helpful to be on the same page with which ones we're talking about--Mammut's previous airbags all use the "inflation system 2.0". The "Inflation System" is the apparatus that connects the air cartridge with the balloon itself, and includes the trigger handle, trigger and a ventouri system that also pulls in atmospheric air to help fill the balloon. 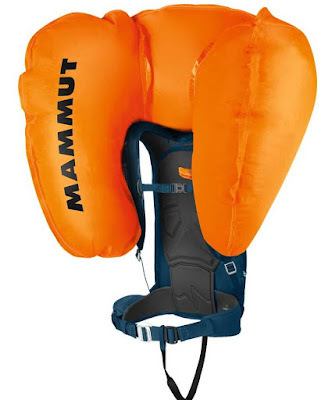 All Mammut-branded airbags made so far have used the 2.0 inflation system. (version 1.0 was the older Snowpulse system which was never incorporated into any Mammut airbags). 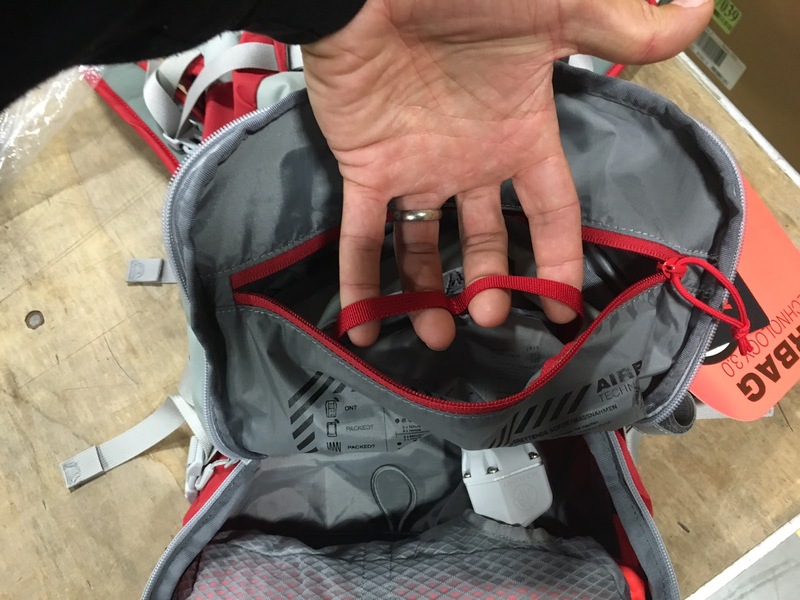 As in the past both the RAS and PAS airbag systems easily remove from the pack for safe conditions or to switch the airbag between different packs--a small, light sidecountry pack one day, and a big roomy backcountry pack the next. This allows a user more versatility and a better value since they can have several packs tailor-made for the days riding, but switch one airbag between them. We think we have one of the best and easiest-to-use removable systems available, and for many riders this adds two-for-1 value to their airbags. We use a pressurized-gas system because it is reliable-enough for safety equipment, even after repeated use or long-term storage, in extreme cold temps, is not susceptible to malfunction from water or condensation, leaving it in the cold car overnight, etc and lasts a very long time even under frequent use. The new airbags use Inflation System 3.0. The Airbag 3.0 on the Left, and a 2.0 on the Right. The separate zippered connection into the pack is gone, so the t-bone buckles are the only attachment necessary. This greatly reduces the fiddle-factor when switching the airbag between packs. The airbag material is the brightest, most fluorescent orange we could make, so it is very easy to see poking out of a debris-pile in low light or fog--visual location is especially important to speed up companion rescue. The airbag material is significantly more puncture and tear-resistant, and also takes up less space in the pack thanks to both the material and a different construction technique. The airbag ventouri and trigger are now one unit made from fiber-reinforced polymer with metal fittings--in the past this was an assembly using a number of machined parts. The new version is "fiber-reinforced polymer", which is fancy-speak for a plastic that is molded with fiber strands to strengthen it and prevent cracking so it's sort of like "plastic on steroids" and is quite strong and very durable, as well as weighs a lot less and is much simpler to arm and handle. It also eliminates many of the connections that could potentially loosen between parts by incorporating it all in one unit. The 2.0 system required a separate tool to arm the trigger before installing a cartridge. On the 3.0 system screwing in the cartridge is what arms the trigger spring, so a re-arming tool is not necessary. You can still test-fire the airbag without inflating it at any time using either an empty cartridge or the "trigger test tool" that is included with the airbag--this allows a user to practice deploying it to ensure having the muscle-memory to trigger it in an emergency. Research (LINK) suggests that the biggest source of non-inflations is people who are simply unable to trigger their airbag--the research shows professional users are about three times less likely to have a non-inflation than a recreational user, which suggests practicing with and being very familiar with the equipment is critical to getting the maximum benefit from an airbag. Fit--in the PAS system, in the past fitting smaller people was sometimes an issue and some people complained about the wide shoulder straps. The new version of the PAS system is designed to fit from an XL down to a 16.5" back length, and the width and feel of the shoulder straps is much closer to a regular pack. (see image below) This dramatically improves the fit for all users. 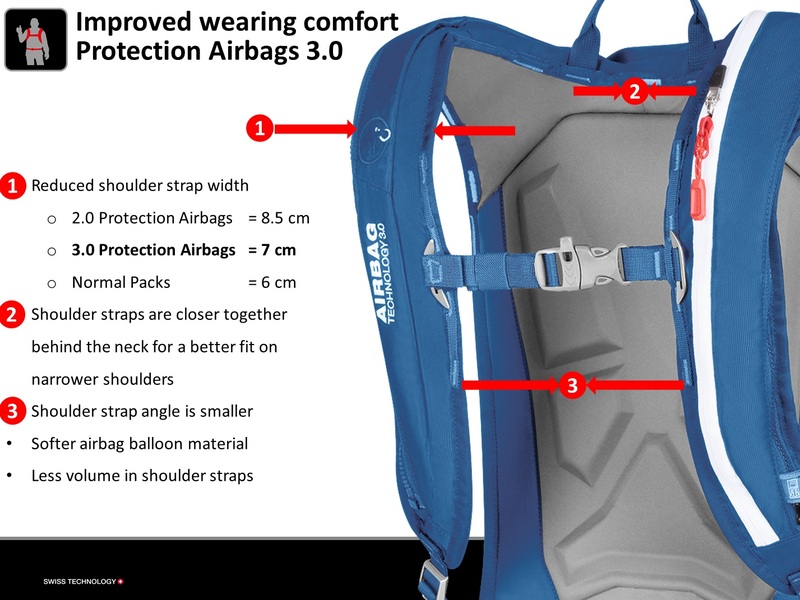 Note the width of the shoulder straps on the 2.0 Protection pack on the Left, a non-airbag pack in the middle and the new 3.0 Protection pack on the Right. The space in between the shoulder straps behind the neck is also much closer together on the 3.0 than in the past and the straps are much softer. 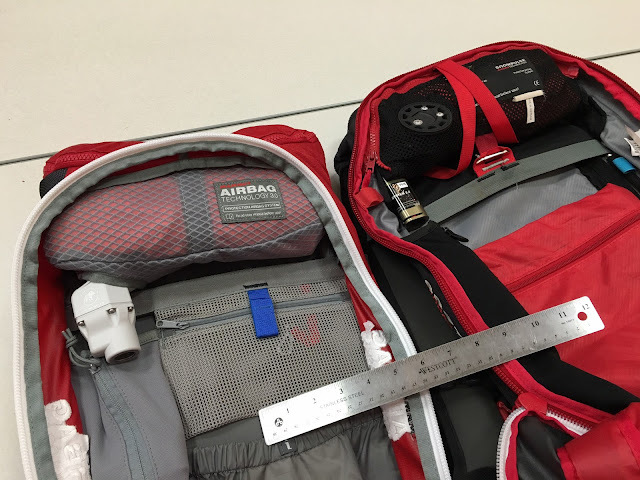 As in the past, the back-length on the PAS packs is adjustable, but now down to 16.5". These improvements make a big difference in getting a good fit on smaller people. The new 3.0 trigger opens more positively and the positive locking feature is waterproof so it is less prone to clog with snow/ice and is easier to use with gloves and mittens on. In addition, the height-adjustable trigger makes getting a good, easy-to-reach fit easy for virtually anyone, regardless of body size. The unique shape of the protection airbag has been shown to reduce G-forces on the head and neck of test-dummies significantly. Research on traumatic injuries from the automobile industry correlate this reduction with a reduction in traumatic injuries. As far as packs, with only a few exceptions the two systems have similar packs available as in the past. In ascending order of pack size, these are described below. Note that all of the packs are available as an AIRBAG ("Light 30l Removable Airbag") which comes with both the pack and the airbag system; and also available as a READY PACK ("light 30l Removable Airbag Ready") which is ONLY the pack "ready to accept an airbag" and does not include the airbag itself--this allows purchasing only one airbag with multiple different packs for great value and versatility. Rocker 15l (RAS & PAS) The Rocker pack is especially suitable for lift-accessed freeride skiing as well as mechanized skiing and riding or short yo-yo laps. The Rocker has ski carry straps and an internal divider to separate safety gear. A snowboard can be carried with one additional strap supplied by the user. Mammut product manager and splitboard hero Micha Vollmer putting the Light RAS 30l through it's paces in some less-than-wonderful snow conditions. 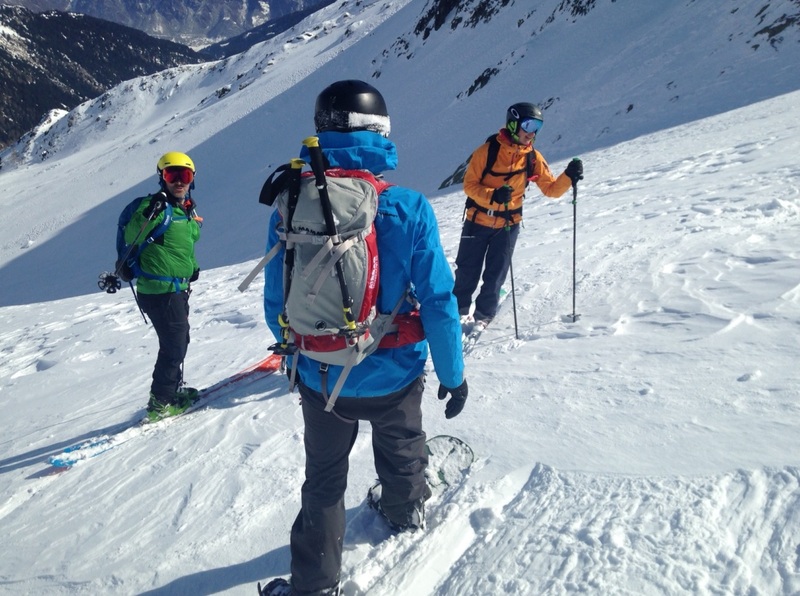 The skier in green is wearing the Ultralight 20l RAS. The Light RAS Shovel pocket will fit our largest shovel blade, and it comfortably fits smaller shovel blades. The very long D-handle on the large shovel shown here is too long to zip the pocket closed, but most T-handles fit fine. The pack itself zips closed fine over any shovel handle, it's only the internal pocket zip that may not close completely with very long shafts. Ride 30l (RAS and PAS) and Ride 28l short (RAS only) The most popular model in Mammut's lineup for recreational skiers and riders as well as many guides, the Ride model features extremely durable 420 Denier Nylon Tritan Ripstop (a very durable fabric with triple ripstop threads integrated into the weave for greater tear and cut-resistance) and super burly oversize zippers. 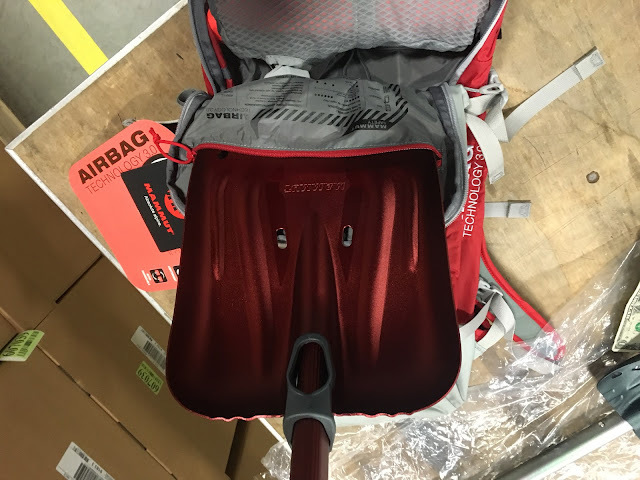 These packs feature an aluminum frame for load-carrying stability, both ski and snowboard carry straps, a roomy exterior shovel pocket big enough for most larger shovels and handles, a plush-lined goggle pocket and an accessory pocket and integrated helmet carrier. Pro 35l & 45l (RAS and PAS) and Pro short 33l (RAS only) The Pro model pack has been a staple for Mammut with guides, patrols, snow safety crews and anyone who needs a durable, larger volume pack. Again utilizing the same 420D Nylon Tritan ripstop fabric mentioned above and oversize zips for durability, the signature feature of the Pro model is the huge back-panel zippered opening that allows access to the main pack compartment without unloading, spilling your gear out in the snow, or having your spare gloves blow away. A large external zip pocket holds most large shovels and handles, a probe and saw, and several accessory pockets provide space for daily necessities like goggles, sunscreen, crystal card and glass, etc. 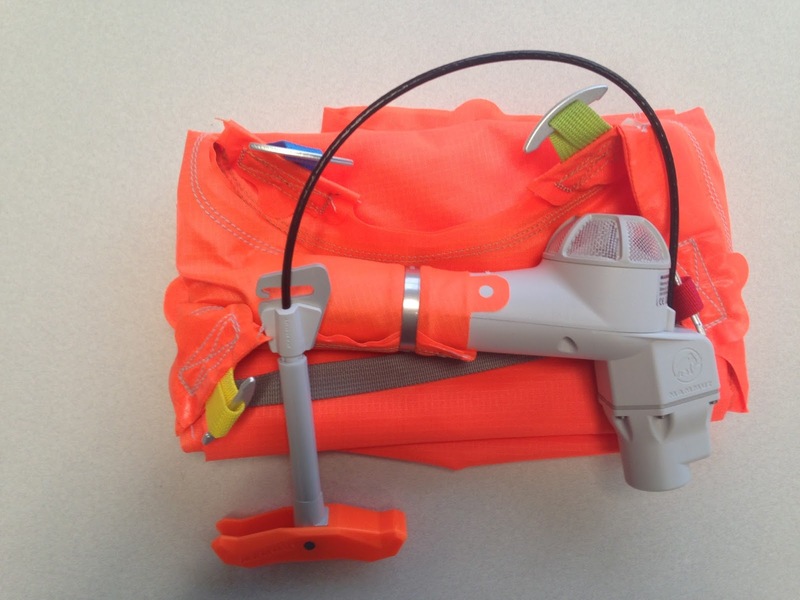 Inflation system 1.0 was only available in Snowpulse-brand airbags prior to 2011, and uses a different trigger and cartridge, and is not compatible with any other system. If your pack has a Mammut logo on it, it's not a 1.0 system. Inflation system 2.0 and 3.0 use the same cartridge. This is the same cartridge that has been available since 2011, so if you already own a Mammut airbag and you decide you want to upgrade to a 3.0 system, you can still use your cartridge with the new system. In Europe they use a 4500psi cartridge that must be exchanged or sent to the factory for refill, while in North America we use a 3000psi cartridge that can be refilled at most dive and paintball shops with dry breathable air using a standard paintball fitting. The North American and Euro cartridges are completely interchangeable, so if you travel to Europe with a US pack you CAN leave your cartridge at home and rent a Euro cartridge, and vice versa. That's where the compatibility ends--with the exception of the cartridges, the 2.0 system and 3.0 system are not compatible with each other. That means if you have a 2.0 airbag backpack you cannot use a 3.0 airbag system in it, nor can you put a 2.0 airbag in a 3.0 backpack. It's important to note that a PAS pack and airbag are NOT compatible with an RAS pack or airbag, even within the new 3.0 system. We tried to engineer some compatibility, but in the end it necessitated enough compromise that it was better to simply make the system with all of the improvements we wanted. If you are travelling from Europe to just about anywhere in the world you are free to carry a full cartridge with you as per the IATA regulations. Unfortunately the US, while it is a member of IATA, does not follow the IATA guidelines. For travelers flying from or through the US, it is possible to remove the entire valve of the cartridge making it legal to fly, but it requires traveling with some specific tools and then you need to fill it either at a dive shop or using a Hill MK4 high-pressure hand pump. The easiest solution is to rent a cartridge at your destination. Mammut has a growing global network of rental stations which can be searched on the dealer search here (LINK remember to click on dealer locator for the country you are visiting). You can also look for a simpler and easier rental solution for travelers in the US this coming winter--we'll have more info on that as we get into the season. I hope this is helpful for people who are interested in getting an up-close look at these new packs. If you are one of those people that holds their breath all summer until the snow flies again, you can look for these to be available beginning in late September and early October. If you are a fleet-manager and are interested in learning more for your organization by all means contact us through this website and we can answer any questions you have. Until then, enjoy the fall weather while you can! Breaking trail with the Light Protection Airbag 3.0 pack this past winter in Colorado. Can a 3.0 pack use a 2.0 airbag? Wojo, this info is in the post: "with the exception of the cartridges, the 2.0 system and 3.0 system are not compatible with each other. That means if you have a 2.0 airbag backpack you cannot use a 3.0 airbag system in it, nor can you put a 2.0 airbag in a 3.0 backpack." Can you still deploy the airbag if you have a snowboard attached vertically to the back of Pro Protection 35L? David, yes, that should work. Does the trigger test tool work on the 2.0 system (Highmark 22)? I can't find anything on compatibility. The 3.0 trigger test tool is not compatible with the 2.0 system. The 2.0 system uses a similar-looking device called a re-arming tool that screws in and then out to arm the trigger, allowing the same type of practice. On the 3.0 system, screwing in the re-arming tool arms the trigger and it is left in place while practicing. The trheads are the same, but neither one will function in the other pack system and could even cause damage. If you have a 2.0 system and need a new re-arming tool, we have them available. If you have further questions or need a replacement re-arming tool best to give our customer service a call directly. Does that means that all of us who purchased the 2.0 system and wants to buy now just a different size backpack are screwed as they become obsolete? Hello. The canisters are all compatable with 2.0 and 3.0. 2.0 systems are all fully functioning systems that are still supported by Mammut. Thanks for the respond but that did not really answered my question regarding backpacks. I do own 2.0 system and 15L backpack. Now when I do more touring I would like to purchase bigger backpack. But you are not manufacturing backpacks compatible with 2.0 system is that correct? Why is there a difference between the US and the European cartridges? Because the US and Canadian government regulations require different parameters than in EU--it's required by law. Hi - can the mammut RAS 3.0 be run for right hand trigger? example highmark snowpulse gear? No, it can not--left hand pull only. Hi, is it possible to unscrew full cartridge from the system? yes, you can unscrew the cartridge any time you want to remove the cartridge.